Our friends suggested we try Bruxie’s while on our road trip to Southern California. Bruxie’s serves up waffle sandwiches, which replaces the bread with Belgian style waffles. 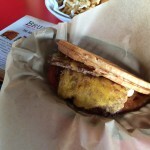 We went to the one in downtown Brea. 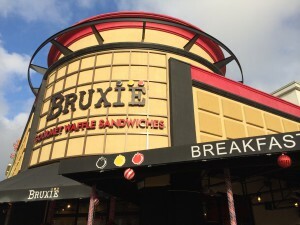 The menu consists of savory and sweet sandwiches, with daily specials that differ by location (currently Bruxie’s has 6 locations in the Orange County area). 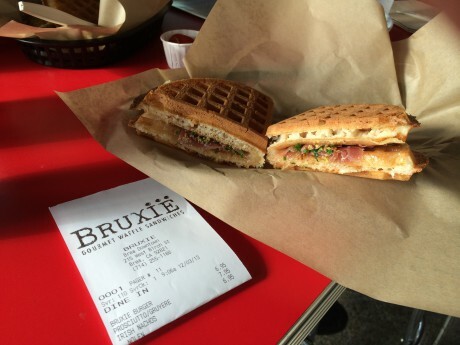 Prices are on par with other sandwich offerings from the likes of Togo’s, Five Guys, etc. 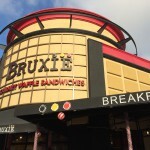 The setup is fast casual, with counter service, and seating at several small tables and bar height stools and tables both indoors and out. 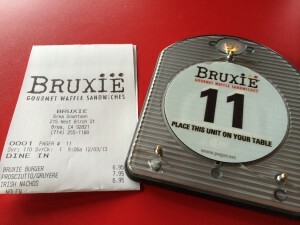 You order at the counter and then are issued a coaster with a number on it. When your order is ready, they bring it to you. 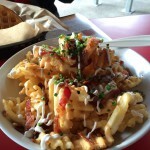 Sides include waffle fries and Irish Nachos. 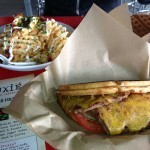 After pondering for a while, we decided to order the Bruxie Burger, Proscuitto with Gruyere, and the Irish Nachos. 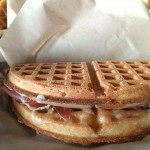 Each sandwich consists of a single waffle folded over to create a pocket for the filling you choose. 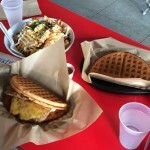 The waffle itself is less sweet and seasoned to taste more like bread than the waffles you would typically get at breakfast places (like at Hash House a GoGo or Bill of Fare). It is also thinner, with an overall thickness of around a half inch. This makes the waffle pretty crisp and rigid enough to hold the fillings. I was expecting the waffle to be a bit denser, but it was pretty airy with the texture/mouth feel of toasted bread. The Bruxie Burger comes with cheddar cheese, tomatoes, lettuce, pickle and mayo. We chose this based on the recommendation of the cashier because he said it was the most satisfying and it definitely was. 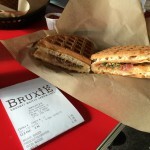 The Proscuitto and Gruyere sandwich was smaller and lighter than the burger. 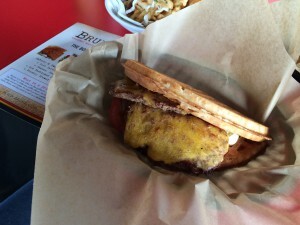 Nothing spectacular or noteworthy, but not a bad sandwich either. Good if you are looking for something on the lighter side. 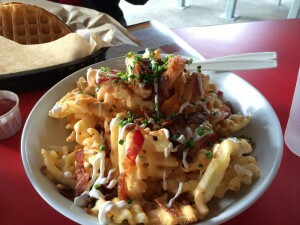 The Irish nachos are waffle fries topped with Bruxie’s homemade cheese sauce, bacon, sour cream and chives. 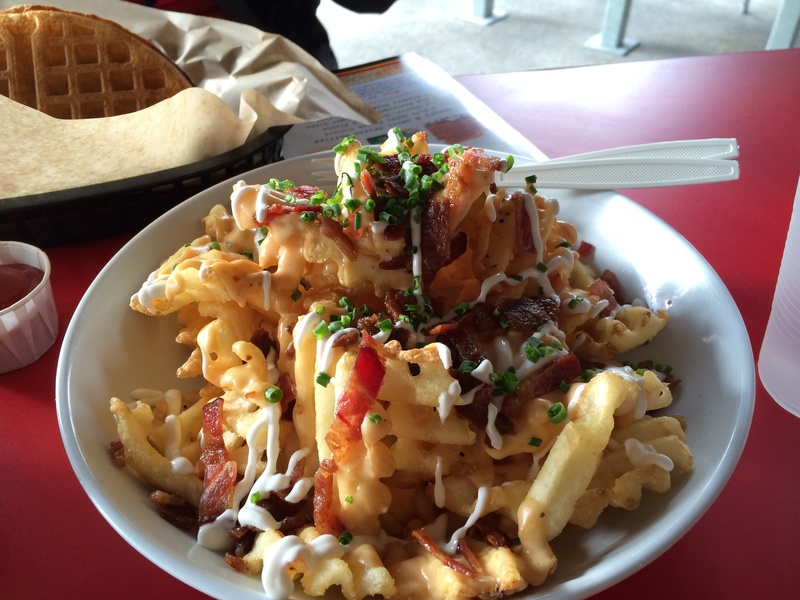 Achieving the correct balance of toppings to fries is always tricky. Too little and you have to struggle to get all the flavors in each bite. Too much and you are essentially fishing the fries out of a soupy mess. 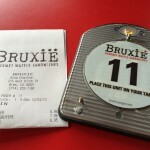 The Irish nachos got the ratio correct and Bruxie’s homemade cheese sauce is very tasty. I would recommend getting this as a side to accompany your sandwich, and the portion is definitely large enough to share with someone else. We talked with the cashier for a bit and he potential expansions could come to Northern California, Arizona, and Texas, as Orange County is getting a bit saturated. 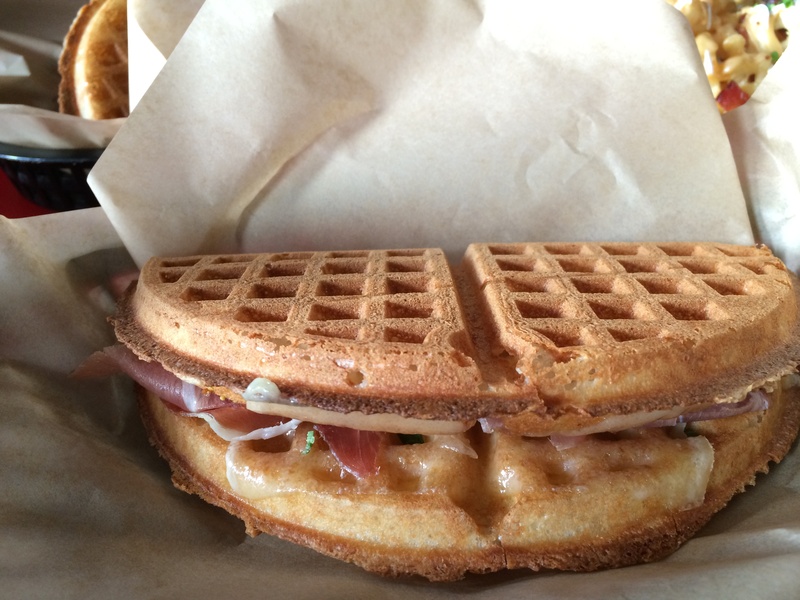 The waffle sandwiches are definitely a novel take on the standard sandwich, and based on our first experience, I would be willing to eat here again and/or seek it out if they opened a location close to us.